Craftsman 299-Piece Ultimate Easy Read Socket Set. 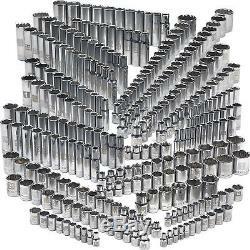 Every chrome socket you will need is included in this Craftsman Ultimate Easy Read Socket Set with 299 chrome sockets to choose from. In fact, this set includes every chrome socket size made by Craftsman in 1/4, 3/8 and 1/2-inch drive, so you won't have to go back to the store to find just the right size. Both standard and metric sizes are included, giving you all the options you need to complete any job that might come up. The set include 1/4", 3/8", 1/2 drive sizes in both regular and deep lengths so you can easily access all those hard to reach places. This Craftsman 299-Piece Ultimate Socket Set with its laser-etched markings offers easy-to-read sizes, which makes it a snap to find just the right socket size you're looking for to complete your task. This ultimate set truly includes the sockets that you as a mechanic, DIYer, handyman or hobbyist will need to get each and every project to completion. The Craftsman Easy Read Socket Set Contains Every Craftsman Socket Made. Easy Read Sizes Take The Strain Off Your Eyes & Let You Find Just The Right Socket Every Time. Standard Sockets (5/32, 3/16, 7/32, 1/4, 9/32, 5/16, 11/32, 3/8, 7/16, 1/2, 9/16); 11 6 Pt. Metric Sockets (4, 5, 5.5, 6, 7, 8, 9, 10, 11, 12, 13mm); 9 12 Pt. Standard Sockets (3/16, 7/32, 1/4, 9/32, 5/16, 11/32, 3/8, 7/16, 1/2, 9/16); 10 6 Pt. Deep Standard Sockets (3/16, 7/32, 1/4, 9/32, 5/16, 11/32, 3/8, 7/16, 1/2, 9/16); 11 6 Pt. Deep Metric Sockets (4, 5, 6, 7, 8, 9, 10, 11, 12, 13, 14mm); 10 12 Pt. Deep Standard Sockets (3/16, 7/32, 1/4, 9/32, 5/16, 11/32, 3/8, 7/16, 1/2, 9/16). Standard Sockets (1/4, 5/16, 3/8, 7/16, 1/2, 9/16, 5/8, 11/16, 3/4, 13/16, 7/8, 15/16, 1); 17 6 Pt. Metric Sockets (6, 7, 8, 9, 10, 11, 12, 13, 14, 15, 16, 17, 18, 19, 20, 21, 22mm); 5 8 Pt. Standard Sockets (1/4, 5/16, 3/8, 7/16, 1/2); 13 12 Pt. Standard Sockets (1/4, 5/16, 3/8, 7/16, 1/2, 9/16, 5/8, 11/16, 3/4, 13/16, 7/8, 15/16, 1); 15 12 Pt. Metric Sockets (6, 7, 8, 9, 10, 11, 12, 13, 14, 15, 16, 17, 18, 19, 21mm); 11 6 Pt. Deep Standard Sockets (3/8, 7/16, 1/2, 9/16, 5/8, 11/16, 3/4, 13/16, 7/8, 15/16, 1); 11 6 Pt. Deep Metric Sockets (9, 10, 11, 12, 13, 14, 15, 16, 17, 18, 19mm); 11 12 Pt. Deep Standard Sockets (3/8, 7/16, 1/2, 9/16, 5/8, 11/16, 3/4, 13/16, 7/8, 15/16, 1); 13 12 Pt. Deep Metric Sockets (9, 10, 11, 12, 13, 14, 15, 16, 17, 18, 19, 21, 22mm). Standard Sockets (3/8, 7/16, 1/2, 9/16, 5/8, 11/16, 3/4, 13/16, 7/8, 15/16, 1, 1-1/16, 1-1/8, 1-3/16, 1-1/4); 14 6 Pt. Metric Sockets (9, 10, 11, 12, 13, 14, 15, 16, 17, 18, 19, 20, 21, 22mm); 6 8 Pt. Standard Sockets (7/16, 1/2, 9/16, 5/8, 11/16, 3/4); 19 12 Pt. Standard Sockets (3/8, 7/16, 1/2, 9/16, 19/32, 5/8, 21/32, 11/16, 3/4, 25/32, 13/16, 7/8, 15/16, 1, 1-1/16, 1-1/8, 1-3/16, 1-1/4, 1-1/2); 24 12 Pt. Metric Sockets (9, 10, 11, 12, 13, 14, 15, 16, 17, 18, 19, 20, 21, 22, 23, 24, 25, 26, 27, 28, 29, 30, 32, 36mm); 11 6 Pt. Deep Standard Sockets (1/2, 9/16, 5/8, 11/16, 3/4, 13/16, 7/8, 15/16, 1, 1-1/16, 1-1/8); 9 6 Pt. Deep Metric Sockets (12, 13, 14, 15, 16, 17, 18, 19, 21mm); 13 12 Pt. Deep Standard Sockets (7/16, 1/2, 9/16, 5/8, 11/16, 3/4, 13/16, 7/8, 15/16, 1, 1-1/16, 1-1/8, 1-3/16); 15 12 Pt. Deep Metric Sockets (10, 11, 12, 13, 14, 15, 16, 17, 18, 19, 20, 21, 22, 24, 27mm). The item "Craftsman 299 Piece Ultimate Socket Set Mechanic DIY Easy Read Chrome Handyman" is in sale since Saturday, May 21, 2016. This item is in the category "Home & Garden\Tools & Workshop Equipment\Hand Tools\Wrenches\Socket Wrenches". The seller is "gameroomfanatic" and is located in Chicago, Illinois.